The ICS phone features an 8 mp camera and 1.5 GHz CPU; eligible for Jelly Bean update. 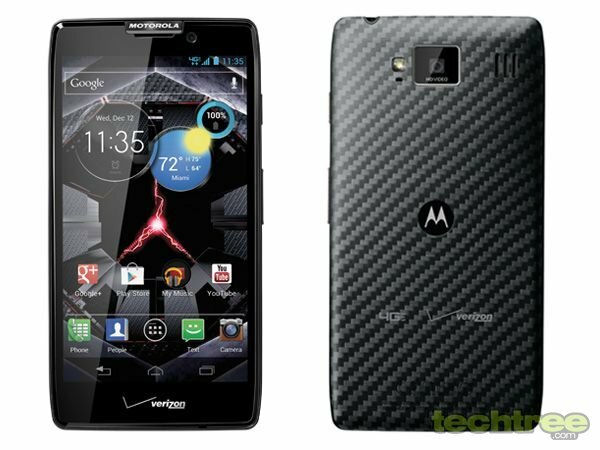 Motorola just added two models to its RAZR series of handsets — theDROID RAZR HD and the DROID RAZR MAXX HD. The former is the company's latest attempt to take on the likes of Samsung's GALAXY S III and HTC's One X. It looks rather similar to its predecessor, the Motorola RAZR XT910 – including the DuPont KEVLAR fabric on back. It will feature Android 4.0 (Ice Cream Sandwich) out of the box. 4.7" HD screen Scratch-resistant Corning Gorilla Glass with water-repellent coating. 8 mp auto focus camera with LED Flash 1080p video recording, 1.3 mp front camera. Android 4.0 (Ice Cream Sandwich); upgradable to Android 4.1 (Jelly Bean). 1.5 GHz dual-core processor, 1 GB of RAM. NFC, Wi-Fi (with hotspot capability), Bluetooth 4.0, GPS, NFC. 3.5 mm jack, USB 2.0, HDMI-Out. 12 GB internal storage, 32 GB microSD card slot. Aircraft-grade aluminium body with a DuPont KEVLAR fibre covering on the back panel. 4G LTE support, quad band GSM (850, 900, 1800, 1900 MHz), quad band 3G (850 900 1900 2100) ; dual band CDMA (800, 1900 MHz) in select regions. Audio formats: AMR-NB, AMR-WB, AAC, AAC+, eAAC+, MP3, PCM, WMA, FLAC, MIDI, QCELP, EVRC, OGG/Vorbis. Video formats: MPEG4, H.263, H.264, VC-1, VP8. 2.7" (w) x 5.2" (l) x 0.3" (8.4 mm) (d), 146 grammes. The handset will come preloaded with the Chrome browser and the Quick Office app. The DROID RAZR HD will be available in white and black; as of this writing, there's no information regarding release date and pricing. Check out the gallery below for more product shots.